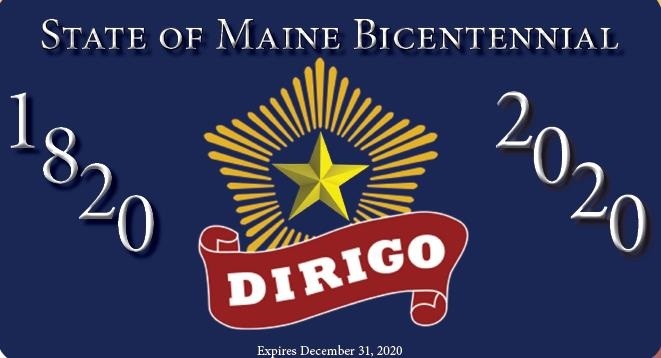 The Maine Bicentennial Commemorative Plate may be displayed in lieu of the front plate from January 1, 2018 until December 31, 2020. The front plate either may be covered or removed. If the front plate is covered, the registrant should keep the annual validation sticker attached to their registration until the front plate is again displayed. If the front plate is removed, the validation sticker should be attached to the front plate, and the front plate should be secured from loss or theft. Only vehicles required to otherwise display a front plate may display the Bicentennial commemorative plate. You may purchase your plate online. (please note there will be a $2 fee to use the online service). You may order the plate by completing this form and mailing it to the address on the form or by taking it to your local BMV Branch Office.